Click! The truth is that at first we were all preoccupied of the sound coming out from a digital power amp and its distance being far from the "reality" of the conventional designs. BIG mistake!!! The "reality" was indeed very far away but from what we initially believed. The sound was crystal-clear, with excellent definition and "body". Its character was reminding me the sound of the tube KORATO-150 (all tube design power amp at 150 Wrms) that I had lived with for quite a long time, with the digital amp's tubey timbre and amazing resolution, transferring to the listener the emotion of the music creator. We heard micro-details and layers of music that we have only heard from high-end power amps of reference quality. The drive of this 200Wrms power amp was exceptional, pushing the TD-12 at their limits, without a trace of distortion, with superb clarity and transparency. Click Here to see other amplifier brand's verdicts in NXOS. Last year we witnessed the introduction of new chipsets from Texas Instruments. that made available the Big Screen in our homes, we saw faster DSP for better convertors and a digital output for the picture section of the DVD player. The digital technology seems to win new ground continuously and it is not very far away the time that even the most romantic audiophiles, will bow to the joys and conveniences of the digital technology. About three years ago, the digital power amplifiers made their appearance by companies like Sharp and Sony with good impressions. For all of us that witness the technological advancements, this means a new beginning of a new technology in the field of sound research. Since that very first introduction of the digital amplifiers, new developments saw the light with the latest on that of TACT that really showed the advantages over the competitive equipment using transistors or valves as amplifying circuits. In this issue we have in our lab the Delta-400, a power amplifier design based on the digital modules of our well-known LC AUDIO, assembled by Greek hands of Nexus Acoustics. The power amplifier that we are testing is a "tog-gun" version based on the Zappulse modules and it is custom made which can also be adjusted to the budget and the power needs of the person placing the order. Nexus Acoustics chose a very nice metal cubic box with dimensions 32cm and a cromium skeleton made by the Swiss company USM, which provides a fully shielded and vibration-free environment for the digital modules. The box is air-tight and only with special tools you can get access to its interior. Inside we see a simple construction, based on the best components available. The amplification stage is based on the LC AUDIO ZAPpulse 2.1 S.E. modules with high-end characteristics that big transistor based amplifiers would envy!! Depending on the power supply, their power output can reach 290 Wrms at 8Ohms and more than 1,050Wrms at 2Ohms, while at bridged mode it delivers 800Wrms at 8Ohms and 1,200Wrms at 4Ohms!! Delta 400 accepts only analog signal at its inputs in either single ended (RCA) or true balanced form (XLR) that it is converted into digital form by a high quality PWM converter that checks the input signal to the output signal at a frequency approaching 500Khz, correction thus, whatever oscillation is generated. The interesting points that differentiate the digital power amps from others are their small size (about the same as that of a credit card) and the high efficiency of the power supply that reaches 96%, compared to the 35% that the conventional power amps reach. This means that with a 500Watt power supply we derive the same energy as that based on a conventional 1500Watt supply. In spite all of this, in order to supply power to very demanding loudspeakers with low sensitivity and impedance, the power amplifier has been equipped with a large 900 Watt toroid transformer, which has been shielded inside a metal box and filled with an anti-vibration elastic compound. The power supply capacitors are the exceptional 4-pole oil-caps made by Jensen (4x10,000?F) with the lowest and very stable ESR across the acoustic band. There are also oil-film by-passed capacitors by Jensen that sit next to the digital modules. The construction of the power supply is hand-wired with hyper pure copper cable in a Teflon jacket. The input wiring to the Zappulse modules and those for the power supply connection are handmade Nexus Gold Biwire a wide frequency-range design, in order to follow the high caliber of the digital modules. Since the Delta-400 that we received for testing was the first power amp that was assembled, we thought of running it through a "crash test" with various sound-system set-ups in order to find out its quality and reliability under difficult loudspeaker conditions. Our initial shock was received minutes upon "firing-up" the digital amp from the very first notes that came out of the Tannoy TD-12, although the power amp was brand new. For pre-amp we used the big Audio Technologies VP-10SE (tube design), the transport/dac combination by North Star Design (with LC AUDIO Zapfilter MkII installed in the analog stage), wiring by Gold Biwire, power cables the AC Transfer, mains filter the Isolator V4 and that from Audio Technologies. The equipment were placed on anti-vibration devices from AZE, AKTYNA and DARUMA. The truth is that at first we were all preoccupied of the sound coming out from a digital power amp and its distance being far from the "reality" of the conventional designs. BIG mistake!!! The "reality" was indeed very far away but from what we initially believed. The sound was crystal-clear, with excellent definition and "body". Its character was reminding me the sound of the tube KORATO-150 (all tube design power amp at 150 Wrms) that I had lived with for quite a long time, with the digital amp's tubey timbre and amazing resolution, transferring to the listener the emotion of the music creator. We heard micro-details and layers of music that we have only heard from high-end power amps of reference quality. The drive of this 200Wrms power amp was exceptional, pushing the TD-12 at their limits, without a trace of distortion, with superb clarity and transparency. The speed and tempo were top-class recreating the desire and emotion to stand up and dance with Cassandra Wilson and Habib Koite. The height, the width and depth of the sound stage were recreated with the correct dimension of the live event and not like carbon-copies. The Dela-400 has a fresh sound of its own, combining the sweetness of a push-pull tube design with the solidity of a reference transistor amplifier. It recreates the lyricism of the voices and the harmonic richness of the instruments like there is no odd-frequency or even-frequency distortion (second or third-order intermodulation distortions). After many listening hours in my system, the conclusions to the reproduction of music through the digital amplifier were only positive ones. At my set-up there stood a revealing loudspeaker that was also an easy load to drive. We thought of various ways to test the limits of the digital amp and the worst-case scenario was found in a hybrid loudspeaker with midrange membrane being magnetostat, its super tweeter pure ribbon and the a Peerless unit as a subwoofer at 400Wrms with the impedance dropping at 1.5Ohms!!! this loudspeaker is a unique construction and we hope to present it soon to you when it comes out of production. The cds were listened to one after the other and in all cases the reproduction of the Delta-400 was exemplary, with extreme transparency, musicality and a sound stage of large proportions. No matter how high the SPLs were rising, this digital amplifier remained utterly without loosing control and only when we reached our pain threshold levels, it showed some points of fatigue and slight distortion. The frequency range was particularly extensive, with lots of air and punchy bass that filled the 10inch Peerless woofer with energy. 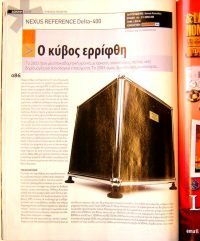 It is certain that the power amplifier of Nexus will not face any trouble driving most of the loudspeakers in the market, whilst with 5 ZAPpulse modules, a 5-channel power amplifier of reference quality can be built for demanding multi-channel systems that will elevate our senses to new heights.